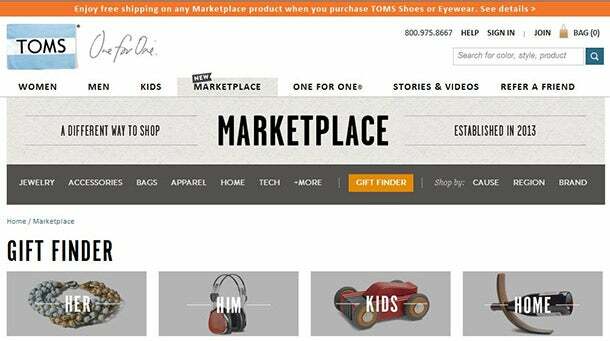 TOMS launched an e-commerce platform for goods made by social entrepreneurs called "Marketplace." In the world of social innovation, Blake Mycoskie of TOMS is a bit of a rock star. Now, he is using his company’s star power to give other like-minded startups a leg up. Just in time for the holiday shopping season, TOMS is launching an e-commerce platform called “Marketplace” on TOMS.com that hosts goods from 30 social entrepreneurs who have mission-driven business models, similar in ethos to the “buy one, give one” model that Mycoskie pioneered. If you're not familiar with TOMS' strategy, for every pair of shoes or glasses purchased, the Los Angeles-based retailer gives a pair to in child in need. Those companies featured on Marketplace are mostly all relatively small and primarily still in the startup phase. TOMS staff has gone through and researched the companies included to verify that they follow through on their social and philanthropic claims. Companies on Marketplace include the likes of apparel and accessory-designer Cleobella, notebook-maker Denik and backpack company Stone and Cloth. TOMS buys the goods at a wholesale price directly from the social startups and sells the goods on the online platform. While Marketplace is almost exclusively an e-commerce venture, a limited selection of goods will be for sale at TOMS’ Venice Beach, Calif., flagship retail location. Since its founding in 2006, TOMS has given away over 10 million pairs of new shoes to children in need. The eyeglasses arm of TOMS started five years later, in 2011, and has since given 200,000 pairs of glasses to those in need.